The pyramids of Egypt are part of everyone’s travel imaginary and recognized worldwide as the symbol of Egypt and its ancient civilization. Most people associate the pyramids of Egypt with the Giza pyramid complex near Cairo, but truth is that Egypt has over 100 pyramids! The most famous one, the Great Pyramid of Giza, is the last remaining of the original Seven Wonders of the World. 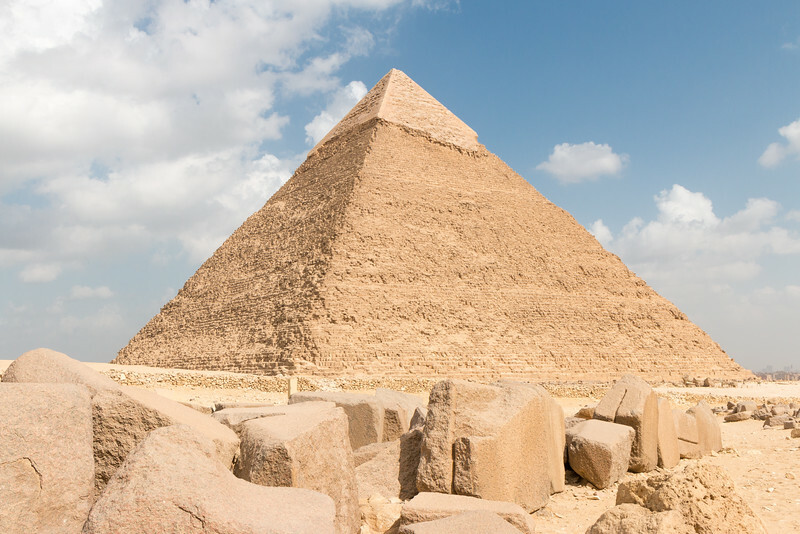 Whilst in Cairo, visiting the Pyramids of Giza and the Great Sphinx is mandatory and, for those looking to explore a little bit beyond the regular tourist trail, we suggest a day trip to Saqqara and Dahshur with a stop in Memphis for the opportunity to see more incredible pyramids and other ancient Egyptian monuments. Together, these different locations make up a UNESCO World Heritage Site. We spent two days visiting these fascinating ancient buildings, first the Giza pyramid complex, and then Saqqara and Dahshur. These places are truly worth seeing as they are some of the best preserved of their kind. Let us tell you how it was. The Giza pyramid complex barely needs an introduction. The three main pyramids are world famous and the landscape shot with all of them on the foreground and with Giza and Cairo in the background has been seen countless times. The Pyramid of Khufu or Great Pyramid of Giza, the Pyramid of Khafre, and the Pyramid of Menkaure are the names of the three pyramids in descending order of height. 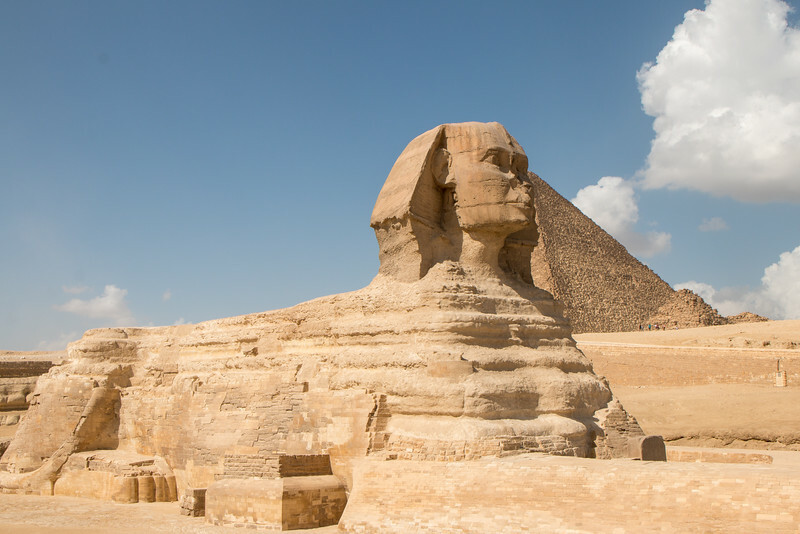 Not to be forgotten is another major highlight of Giza – the Great Sphinx, a magnificent sculpture of a human-headed lion. Nowadays things are much calmer than usual at the pyramids. With tourism taking a big hit over the last few years, the site looks and feels very empty. While this is terrible for Egypt, it provides an excellent opportunity for those visiting now to avoid the crowds. A visit to the Giza pyramids usually starts at the gate close to the Great Pyramid where the main ticket office is located. 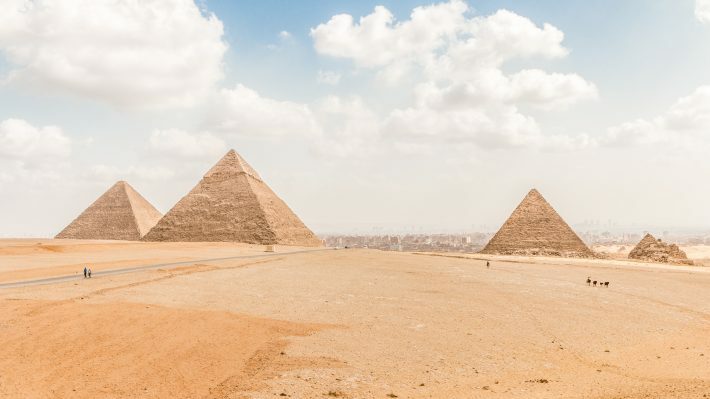 It’s important to decide here if you want to go inside the pyramids because you’ll need an extra ticket, or two if you decide to go inside a second one. Only two pyramids are open at a given time, the Great Pyramid plus another one on a rotation basis. 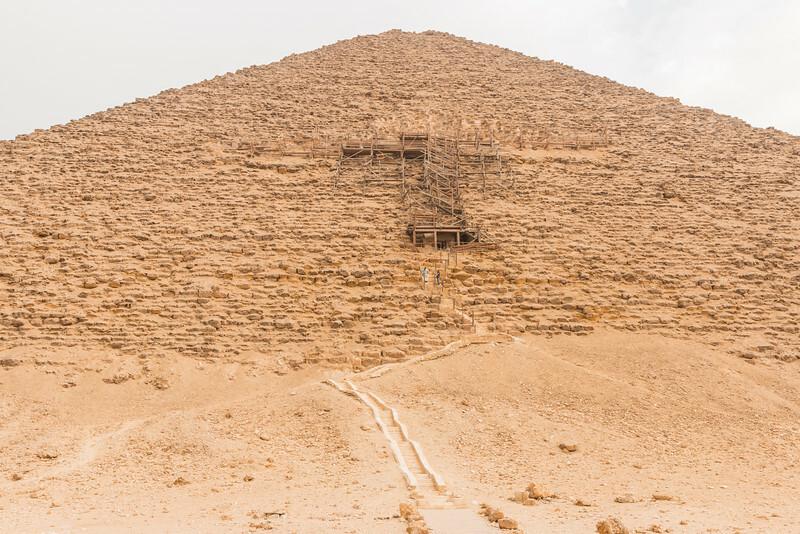 In our case, we had the opportunity to go inside the Menkaure Pyramid besides the Great Pyramid. The Great Pyramid of Giza is undoubtedly the most famous and busiest one, both inside and outside. While probably most people don’t go in, it still feels quite busy. There’s nothing inside besides the burial chambers, which are now empty. The best part about it is the experience of entering a pyramid that’s a few thousand years old, and that is priceless! We continued our visit by heading up to the hill where we were able to get the best view of the pyramids and do a quick camel ride through the desert. That was quite the experience! Now, seriously, even if you don’t fancy riding a camel, the view from there is totally worth it. Back down, we visited the two remaining pyramids, Khafre and Menkaure, and went inside the latter. While smaller than the Great Pyramid, its interiors are equally worth seeing. Plus, it was pretty much empty. One curious fact is that at the top of the Pyramid of Khafre there’s still a bit of the limestone casing that used to cover the pyramids. The final stop of our busy morning at the Giza pyramids was the Great Sphinx. This massive sculpture is another wonder of the ancient Egypt and one that must be seen from close distance. It is known for its missing nose which has sparked many theories about how it went missing. 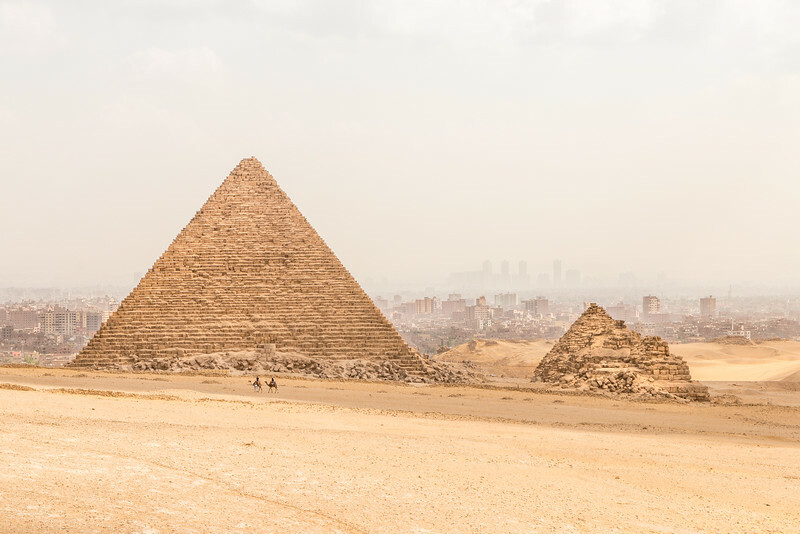 The Giza pyramid complex is also home to other minor and relatively less important pyramids and tombs which you can see while exploring the main sights. Saqqara is a large ancient burial complex best-known for the famous Pyramid of Djoser, or Step Pyramid, the first Egyptian pyramid dating back to 2649-2575 BC. Its unique stepped design is very different from a “regular” pyramid but hey, this was the first one and an innovation at the time. 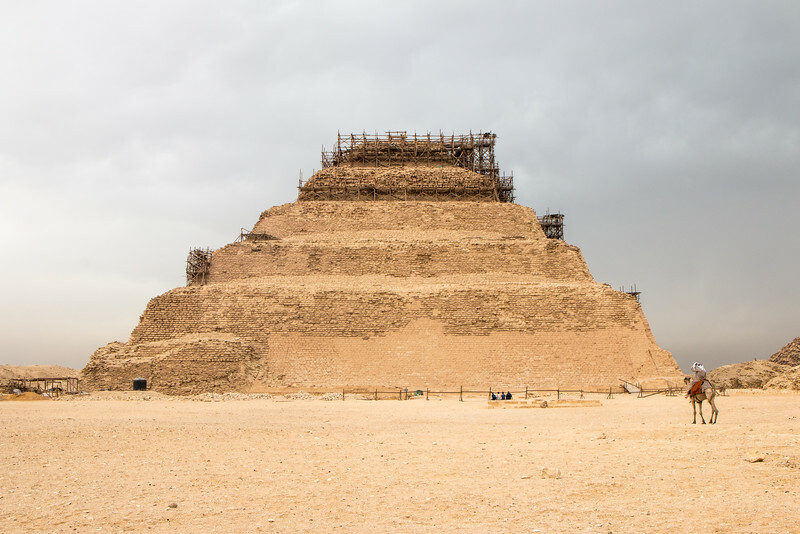 The Pyramid of Djoser consists of six mastabas built on top of one another up to a height of 60 m, and a vast underground network of tunnels with chambers and galleries – not accessible. What makes Saqqara a great place to visit is not only the Pyramid of Djoser but also all the surrounding complex which consists of other smaller pyramids (eg: Pyramid of Unas), several important tombs with magnificent inscriptions on the walls, a colonnaded corridor, among others. There’s definitely plenty to explore. The good news is that Saqqara is only 30 km south of Cairo and still not a popular place to visit compared to the Giza Pyramids. Allow a few hours to check out the highlights of the place. Dahshur is a royal necropolis located in the desert 40 km from Cairo, a little bit further south from Saqqara, whose pyramids are amongst the oldest, largest, and best-preserved in Egypt. 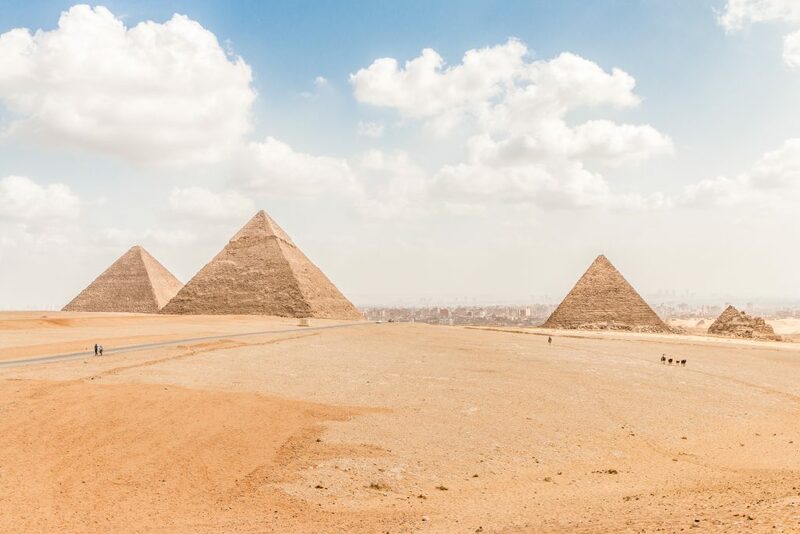 Built between 2613-2589 BC during the reign of the Pharaoh Sneferu (4th dynasty), the Bent and Red pyramids are considered to be very important also due to the fact that they were used as part of the learning process for the construction of the Great Pyramid of Giza. The pyramids of Dahshur are within the site of a military base and not long ago access to them was much more restricted than it is today. There are also other pyramids in Dahshur such as the Black Pyramid plus a few other minor ones and some scattered tombs. Due to the off the beaten path location, not a lot of people visit Dahshur. Imagine having two Egyptian pyramids all for yourselves – that’s what happened to us! It was hard to contain our excitement about seeing a pyramid for the first time and minutes later we were preparing to go inside the Red Pyramid. 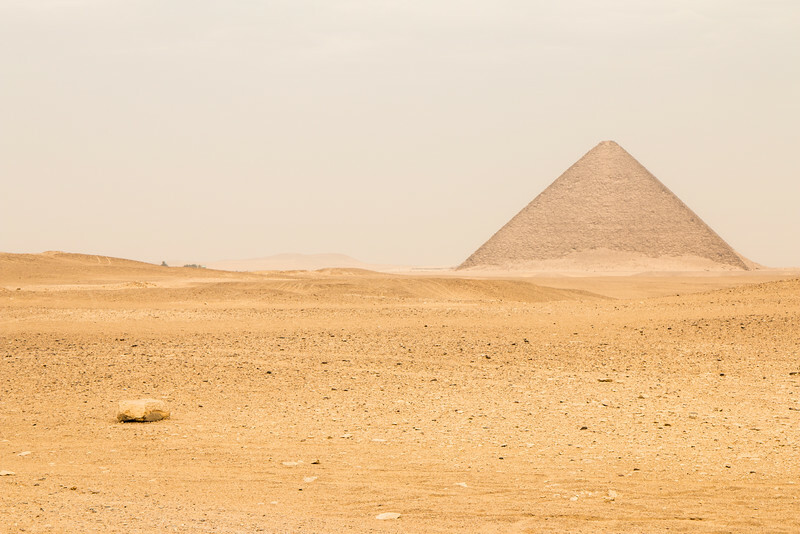 The Bent Pyramid has an appropriate name due to its shape, a consequence of a couple of design flaws. The terrain wasn’t very stable to withstand its weight and the angle changes halfway up. This pyramid is not open to the public yet there’s a small satellite pyramid right next to it that can be easily climbed using a visible path. 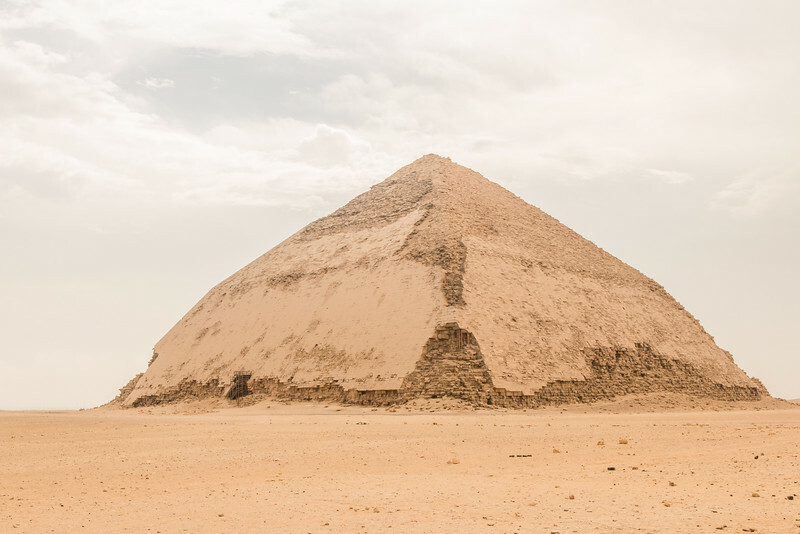 Not happy with the issues that affected the Bent Pyramid and willing to correct them, the Egyptians decided to build the Red Pyramid, the first true smooth-sided pyramid and the one that was used as an example for the bigger Great Pyramid of Giza. The wooden staircase with 100 odd steps you see in the picture below leads to the entrance of the Red Pyramid. Once there, you enter a narrow downwards tunnel that ends at the first chamber – you’ll need to bend to descend. There are 3 chambers in total, including one that sits just at the center of the pyramid and of which you can see its amazing inner ceiling, plus the burial chamber. These are two of the best pyramids of Egypt! Memphis is a usual stop on a day trip to Saqqara and Dahshur and, although there are no pyramids there, its importance as the ancient capital of lower Egypt makes it worth visiting. Today only a tiny part remains and it can be seen as an open-air museum. 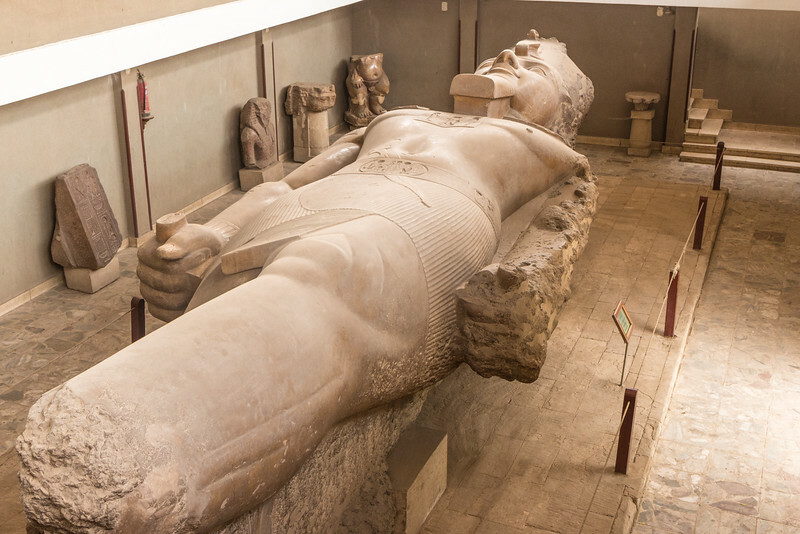 The highlight of visiting Memphis is the colossus of Ramesses II, a 10 m statue of one of the greatest Pharaohs of all time that lays protected under a small indoor space. There are also other interesting sculptures in the outside part, including a nice-looking Sphinx. Overall, visiting the museum doesn’t take more than an hour. Giza is very close to Cairo and plenty of tours and transportation options are available. While a guide is not essential, it will definitely help with providing information about the pyramids and tips on how to avoid the touts – which is not very serious if you just ignore them. 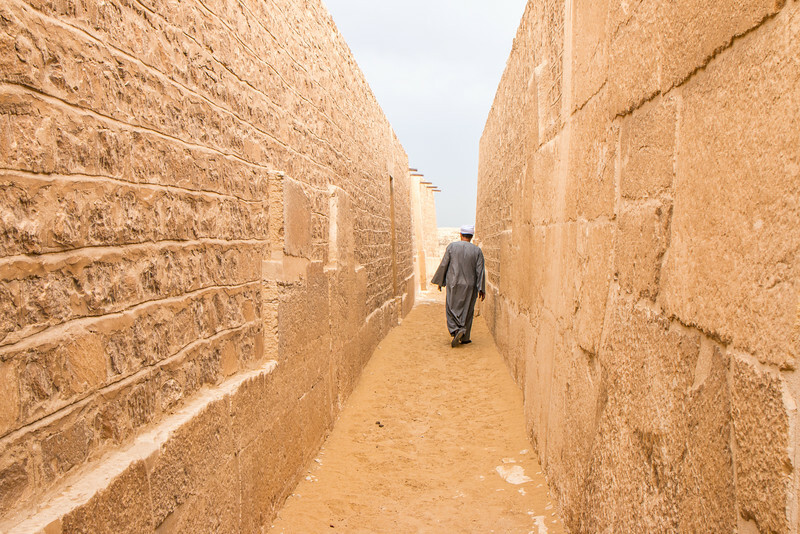 In order to visit Saqqara and Dahshur, the best, and pretty much the only, option is to arrange private transportation. We opted to use Egyptian Sidekick and they provided us with a driver and a “sidekick” to help with Arabic and some high-level explanations about the places we were visiting. Very convenient. A question we get plenty of times is “how is it like inside the pyramids?”. Long story short, it’s very hot inside and usually with little space available. It’s a wonderful experience but certainly no place if you’re claustrophobic. Egypt is usually very warm, so we recommend bringing plenty of water, comfortable shoes and clothes. After all. these monuments are located in a desert. A hat and sunscreen are helpful as well. Dreaming of visiting the pyramids of Egypt? Which one is your favorite? I really loved visiting the pyramids in Egypt. There’s nothing quite like crawling into the Red Pyramid and seeing how crazy small the tunnel is to the inside. It’s really incredible what they’ve done. Highly recommend this trip for everyone. Indeed! Thank you for sharing your experience, Laura. Egypt has been on my bucket list for a long time and this article makes me want to book the next flight out. Very interesting to read that there are over 100 pyramids. 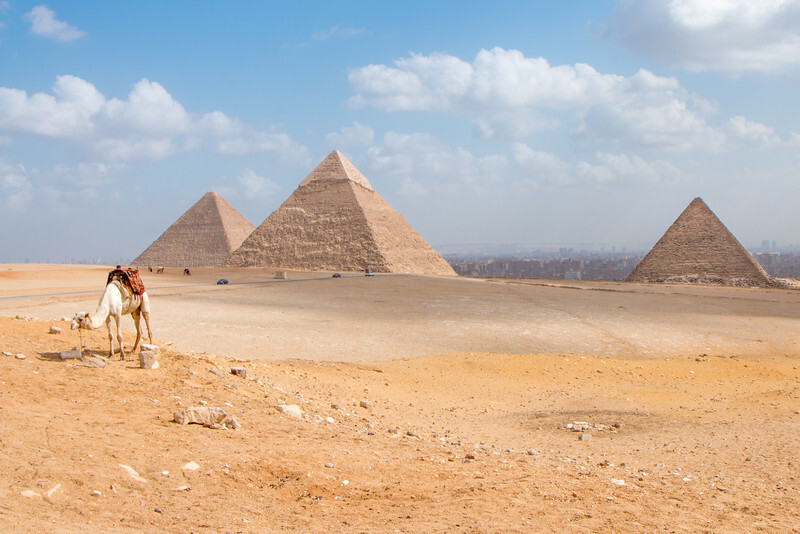 I’d love to visit them all…including the most famous, Giza. Great tips on how to prepare as well the option of the guide. Thanks for sharing. Glad you liked it! Hopefully more people will visit these amazing monuments. Incredible finds! I love the idea of taking a tour to see and visit the ‘lesser’ pyramids. Don’t need a picture of me on a camel with the Giza in the background either. I’m not that kind of traveler! Thanks for the info. I do dream of pyramids in Egypt. It was very interesting visiting Dashur and Saqqara because there was no one there. Highly recommended. Egypt and the pyramids have long fascinated me. It’s been my dream to visit for as long as I can remember. I knew there were more than just the pyramids at Giza, but didn’t realize over 100 still remained around the country. These are such great tips! I haven’t really had a chance to look into Egypt travel and more information on the pyramids, so this was the perfect overview. Good tip about Egyptian Sidekick– I like that they have a “sidekick” to help with things! Beautiful photos as well. Having someone to help with transportation, language, and touts was really good. Trouble-free visit! I am so excited! I am going to be visiting Egypt in January next year. I find the story behind the pyramids so fascinating. Great post! Thanks for the detailed information about visiting the Egyptian pyramids. Your photos really demonstrate how close the sprawl of Cairo is to the Great Pyramid complex! As you mention, it doesn’t long to get there from the city. I would love to see this last Ancient Wonder of the World in person! Thanks, Claudia. Yes, they’re quite close! Visiting the pyramids is definitely on my bucket list. I’m going to have to dig through more of your site and read more about visiting Egypt. It’s one of those places I desperately want to visit but am a bit concerned by everything going on in the region. Did you have any challenges when visiting? It’s really worth visiting. We had no issues whatsoever but we joined a small tour to facilitate a few things such as transportation and Arabic. I enjoyed reading your article very much ! Egyptians are very hospitable and friendly nation despite all the badly politically motivated articles here and there. 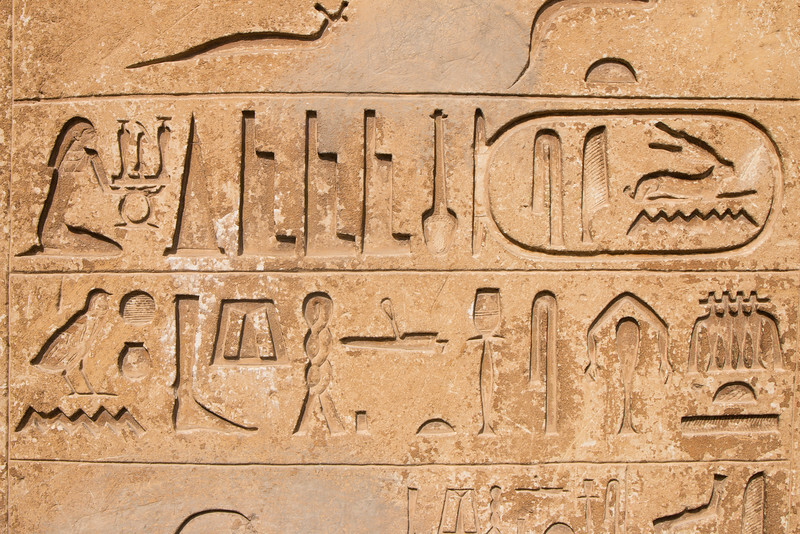 I recommend also visiting Luxor – it is literary an open museum with amazing history and beautiful scenes and temples. Thanks! You’re right, Luxor is amazing. We also have an extensive article about it.